Sitting down to gamble is a fun, sometimes even thrilling, hobby. So when you can do it from the comfort of your home, many online gambling enthusiasts agree that it makes the pastime twice as enjoyable. The first online casino available for use in the U.S. was introduced in 1995. 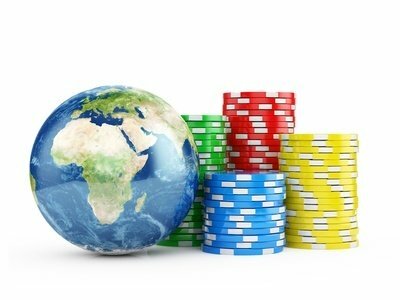 Since then, online gambling has exploded, not only in the U.S., but on a global scale. Although due to the United States’ regulations regarding online gambling, it is an immensely popular industry and is expected to grow to a whopping $2.5 billion by the year 2015. So, which regions are contributing the most to that pot? Here are the top ten gambling nations in the world as of January 2014. The people in Spain certainly love to gamble. In fact, Spain has the largest Christmas lottery in the world; called “El Gordo,” this lottery gives away more than $1 billion in money and prizes every Christmas. The average gambler in Spain loses around $418.00 per year. Economically speaking, Greece isn’t doing so well; however, Greek gamblers were unfazed, losing $2.3 billion to online gambling a year ago. Greeks lose an annual amount of $420.00 per person. The majority of online gambling is illegal in Norway. The government is very strict, and there are only two companies that can allow Norwegians to bet online. A law was passed in 2010 forbidding customers to use their bank cards at any online casino in the world, which the banks enforce. That did not stop the online gamblers; 88% of them confessed that they were lifetime gamblers and the average Norwegian online gambler spent $448.00 last year. You can only gamble online through the Jockey Club and even then you can only bet on one lottery, football games, and horse racing. The government takes taxes from all winners. A gambler in Hong Kong loses about $503.00 per year. Ten years ago, regulations on gambling online were cut, and Italy is now the largest online gambling market in the world. Legalized online gambling is available 24 hours a day, 7 days a week. The average online gambling Italian loses around $502.00 annually. The government is all over Finland when it comes to online gambling, but not for the worst. Online gambling is national monopoly divided into three organizations, and all monies go to horse breeding and sports. Instead of trying to regulate online gambling more, the government is looking at ways that would strengthen the monopoly. An online gambler in Finland loses approximately $553.00 annually. Seventy-five percent of adult Canadians got into online gambling last year. The government views online gambling monies as good revenue for the country but does require good record keeping. Online gamblers lose around $568.00 annually. Ireland only made this list because they do have a solid online gambling presence and their losses are the third highest in this list. Land-based gambling is preferred in Ireland. Average Irishman online gambler loss: $588.00 per year. Number two on the list is Singapore, as its government recently decided to limit internet gambling due to an extravagant of monies lost. This caused Singapore Pools (a lottery operator) is looking to open the first Singapore gambling website, which will be fully licensed. How much do Singaporeans online gamblers spend per year? Only $1,174.00 on average. The number one spot on the list goes to the land down under. Eighty percent of the population participate in some form of gambling. Gambling winnings are untaxed, which provides pretty big incentive (you think?). The average gambler in Australia loses a whopping $1,288.00 per year.